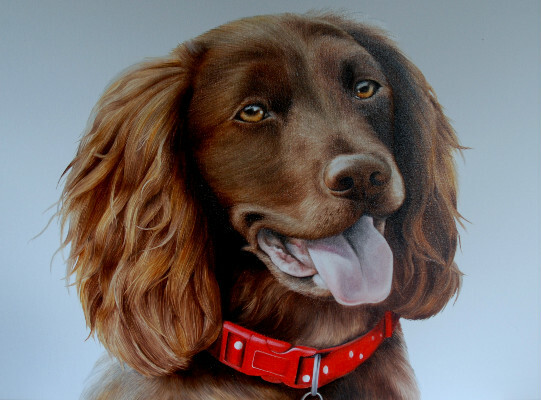 Back in the summer, which seems a long time ago now we have all this horrible weather, I met the lovely Fiona at the Melplash show, on display was a painting I had done of a gorgeous chocolate brown cocker which captured Fiona's attention as she too has the joy of having one of these wonderfully loving pooches in her family. I headed over to Fiona's beautiful home to meet Skye and was greeted by a very waggy tail, not just from Skye but also her best friend and fellow Spaniel Hector. 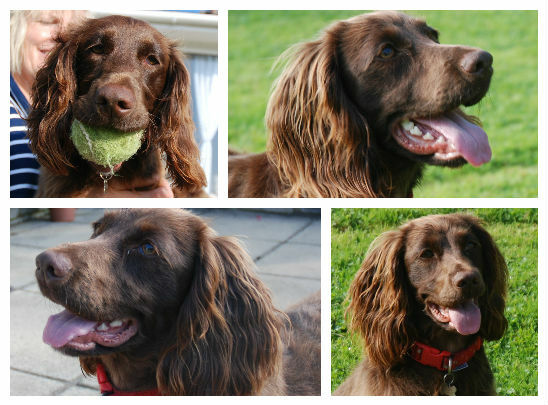 We thought it was best to take photos of Skye doing what she loves best.... chasing her tennis ball (hmmm that sounds familiar!!) and Hector, although a fair few years older than Skye also got involved in the action. After an enjoyable photo shoot we picked out our favourite photo to base the painting on which Fiona felt best captured Skye's lively and loving personality. Fiona went for the extra large canvas, a size I always enjoy working on, it's great to work on large scale as I feel you can really capture the details and make an impact with the painting. I sent over a photo of the painting before delivery and Fiona had this to say... "I just love the painting of Skye, well done!! I think you have captured that cheeky glint in her eye." I was then more than happy to drop the painting off and have another play with Skye and Hector, any excuse! Tough job but someone has to do it!